Happy cookie Friday everyone ! So , early last week I made Pink lemonade cupcakes , and tonight there’s a sleep over with a bunch of little girls, who requested I make this recipe for them. It’s a very easy and yummy recipe. Hope you enjoy it, have a good Weekend! 2. Cream together, butter, salt, sugars, vanilla. Add egg yolk and 1/3 cup of pink lemonade. 3.Add flour ,baking powder and mix. 4. Add 2 drops of food coloring and mix until dough forms. 5.Press dough into sprayed 9 x 11 pan and bake for 12-14 mins do not over bake. Remove and let cool. 6. Once bars has cooled it’s time to frost. 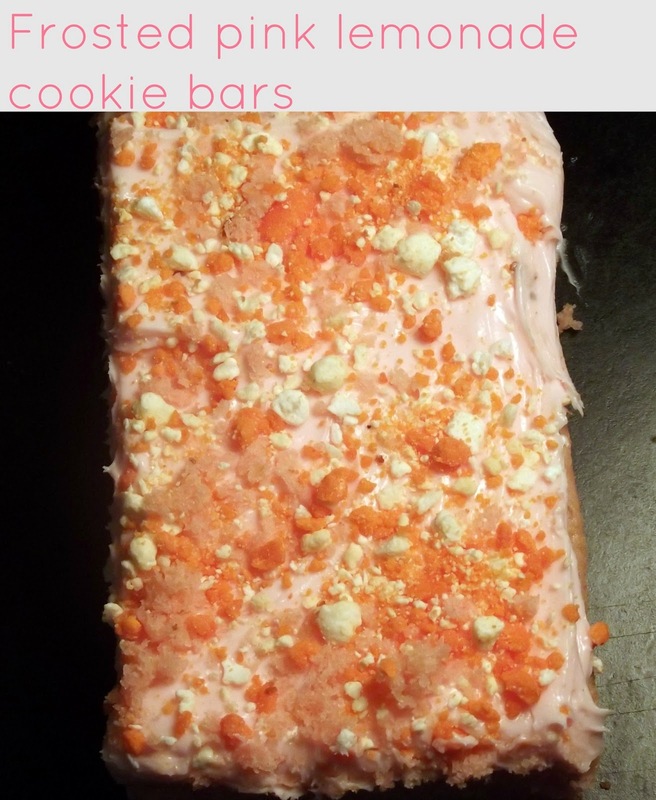 Spread a thick layer frosting over bars and sprinkle sprinkles over frosting. It’s ready to serve.